Click for Sibenik hotel deals. 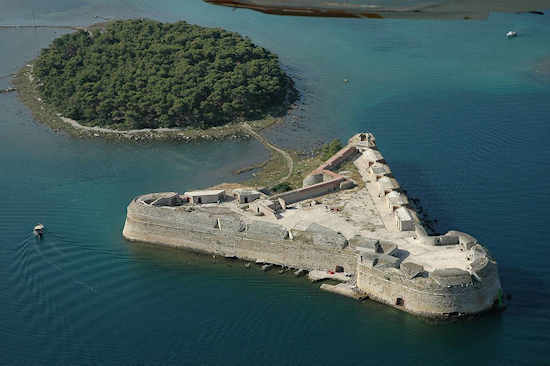 The unusual island fortress of St Nikola in Sibenik is part of the Venetian Defensive System that Unesco has recently inscribed on its list of World Heritage Sites. Like Zadar's Walls, the Republic of Venice built St Nikola's fortress in the 16th century to protect the town from attacks by Ottoman Turks. With its unique triangular shape and sturdy construction, it became the strongest fort on the Croatian coast. Sibenik was important to La Serenissima for its agricultural products and nearby salt pans. The fortress was erected to protect Sibenik's vital port and thus was situated at the entrance to the narrow milelong channel of St Anthony (Sv Ante) which connected Sibenik to the open sea. 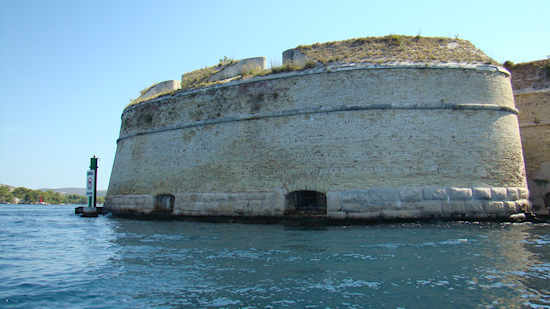 Like other forts in the Venetian Defensive System, St Nikola was a bastioned fort in the alla moderna style. The celebrated Venetian architect, Michele Sanmicheli, designed it and his nephew, Giangirolamo Sanmicheli, built it between 1540 and 1547. Stretching over .85 hectares, the fortress is composed of three levels. The ground floor is in stone and the upper level is in brick which was considered more resistent to cannonballs. The northern side is semi-circular while the southern side has eastern and western bastions and is connected to Ljuljevac island. Entrance to the fort is through an eastern gate that is the only decorative element in this sober fortress. 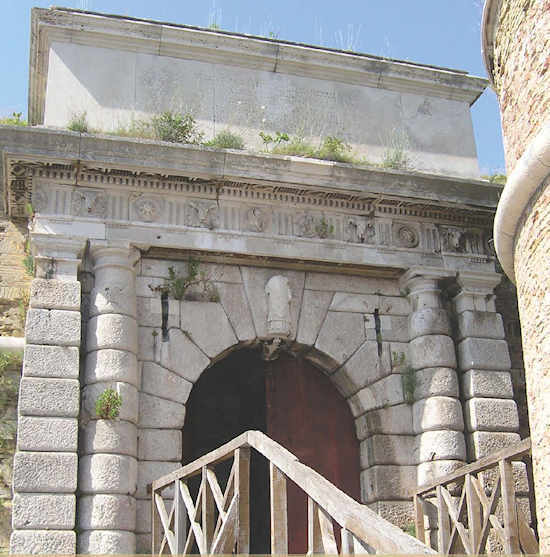 The design is typical of other Venetian gates designed by Sanmicheli with a Renaissance-style architrave. Notice the figure of St Nikola in the center. On the interior wall opposite of the entrance gate there are four carved coats-of-arms from doges and local luminaries and an empty niche that once contained a Venetian lion. Stairs descend to sea level where the vaulted interior is wide open with gun ports in the semicircular space. A vaulted ramp leads to the upper terrace of the fort where there are magnificent views of Sibenik town. This upper level was once enclosed and served to garrison troops but it was reconstructed in the 19th century. Gun ports and parapets from that epoch remain. 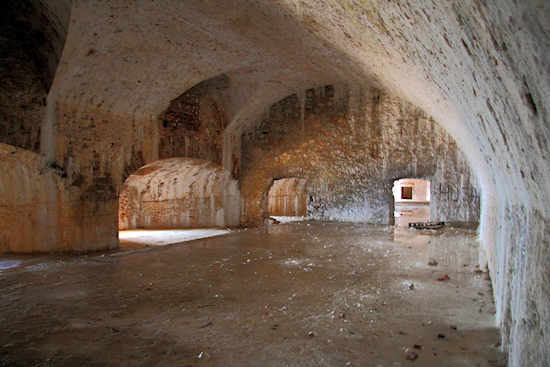 Now that the fort has become a World Heritage Site, funds have become available to improve access. Currently, it is easiest to access via private boat but it's also possible to follow a pathway from Panikovac bay along the St Anthony channel to the fort (4.5km) and then climb in via planks.